Just in case you weren’t aware, espresso is the Italian word for fast, and this should go a long way to explaining why coffee shops are popping up all around the world. Espresso is produced by literally forcing water through coffee beans which have been finely grounded therefore extracting as much of the flavor as possible. Many years ago this process was extremely difficult, but the modern espresso and coffee machines make this far easier. The first coffee machine was invented by Luigi Bezzera in 1901. 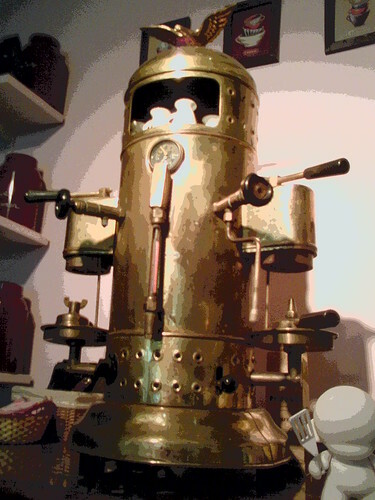 Bezzera’s coffee machine was separated into four parts and also included a boiler. The process, however, wasn’t that much different to today in that boiling water and steam were forced through coffee beans in order to produce a liquid that was deposited into a cup. It is this process from which the espresso was derived. Just two short years later the patent to “Bezzera’s Coffee” was purchased by Desiderio Pavoni, who then opened the Pavoni Company by 1905. The company manufactured coffee machines and the first of these finally made its way to the U.S. by 1927. However, even after nearly a quarter of a century of manufacturing machines and producing coffee the end result was far from perfect. Unfortunately, the way in which both boiling water and steam was forced through these early coffee machines did nothing more than produce a burnt taste of coffee. However, it still took over a decade for a solution to be produced. The solution was a piston pump, which made sure that no boiling water made its way through to the coffee beans, but rather just steam. This design of coffee machine was then used, fairly successfully for a time, at a coffee bar owned by Achille Gaggia. Further development of these coffee machines then took a back seat at the outbreak of World War II. In fact, all of Gaggia’s new designs of coffee machines were unfortunately completely destroyed by a bomb during the war. 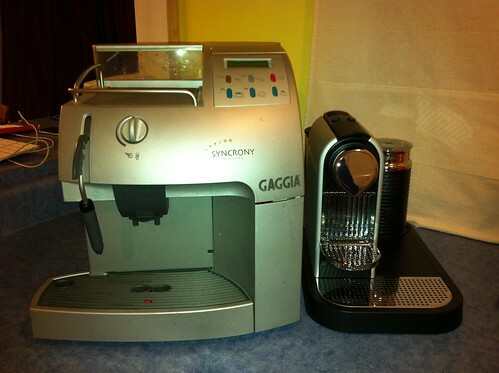 Gaggia set about working on the new style of coffee machine with a piston pump straight after the war. The new style of machine also included a spring lever, which simply enhanced the overall process by applying gentle pressure to the coffee beans without any outside help from the boiler. In fact, it was these machines that were the first to ever produce froth or cream that we are used to seeing on an espresso. With that being said, the first “frothy coffees” were not very well received by the public, many of whom would enquire why they had scum on their coffee. Gaggia replied that this was merely a cream and it is from this coffee cream derived. The next important step in coffee machines came about in 1961 when M. Faema manufactured a machine which had an additional electric pump. It was the electric pump which was now used to force water through the coffee beans, and this model that is now over 50 years old is most reminiscent of the coffee machines we see in stores and coffee shops around the world today. The author of today’s post, Toby Mathews, is a freelance blogger who often writes for Caruso Caffe, a company dealing in a range of kitchen appliances. His other hobbies include hiking and swimming.